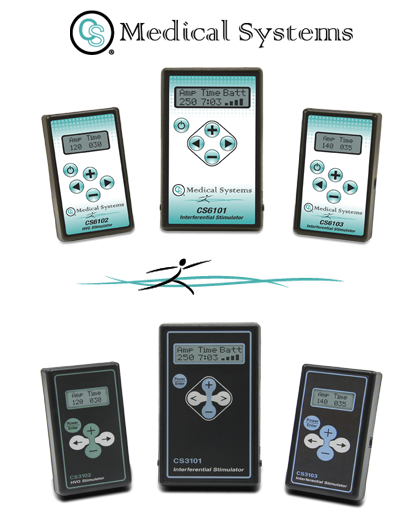 Control Solutions LLC manufactures a line of clinical-grade muscle stimulators available online directly to doctors, physical therapists, and licensed practitioners as required per the FDA. Please visit our web site at www.csmedsys.com to procure those products directly via credit card along with your state license number. if you have one of these older products, it is likely to be out-of-warranty but can be serviced directly by Control Solutions LLC. There will be a cost associated with that service/support. NOTES: If you own an older model CS3101 interferential stimulator and the internal rechargeable battery is no longer holding a charge, this can be replaced by Control Solutions LLC at our factory in Chicago. You can order this service to have your stimulator returned for battery replacement and re-certification by going to our web site and purchasing one (1) of the CS4101 repair services using your credit card. If you see "Clinician Service Required" on the screen of your stimulator, please contact the doctor who prescribed the stimulator unit. This typically means the end of the treatment protocol has been reached and the stimulator and treatment need to be reviewed by the doctor. For other information about service and support of your muscle stimulator, please visit our repair services page.